Upcoming workshops at Duckett’s Grove and look what Debbie created incorporating one of my flowers! I've had a pretty frustrating week computer wise, thanks goodness for the iPad otherwise I might have gone totally mad! Next weekend I have a felt bag workshop happening on Saturday 16th February in Duckett's Grove, the initial process is the same for vessels and other three dimensional objects so if either bags with integrated handles, pockets and flaps or strong, sculptural vessels are your thing please email me asap to book your place. On Saturday 2nd March I have a beginners and improvers flat felting workshop happening, again please email me if you would like to book a place. These will both be intensive hands on classes where you will leave at the end of the day with a beautiful finished piece and the knowledge that you will confidently be able to repeat the process at home by yourself, more details over on the workshop page. Before Christmas I met a lovely South African lady called Lizette at Borris Food and Craft Market. She bought some of my naturally printed and dyed nuno felt to bring home for gifts and also selected a few flowers in nice bright colours, felt and silk are wonderfully lightweight to transport so make perfect presents for anyone heading off in a plane!!! Anyway, Lizette is back here for a visit and called in to say hi again at the market on Friday. With her she brought me a gift of the latest 'Bead Book' magazine sent from her good friend Debbie Rijns, director of education at Precious Metal Clay South Africa. 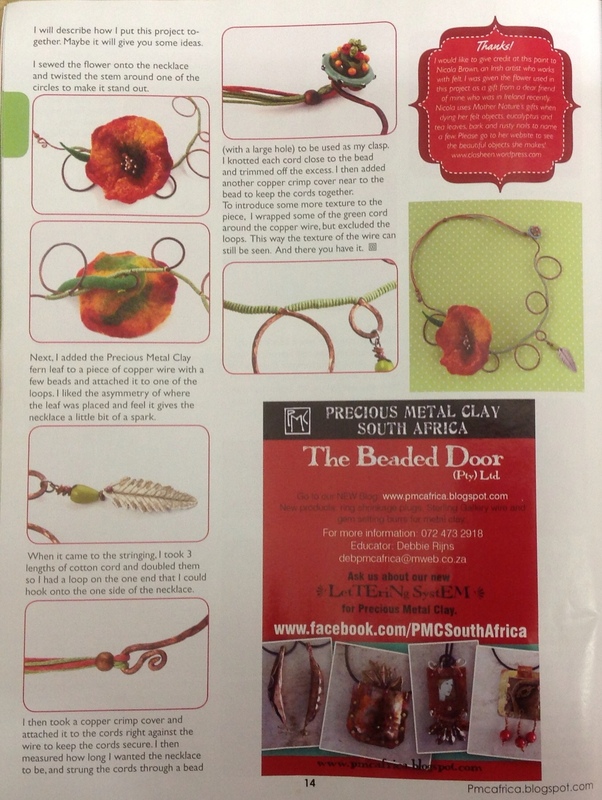 In the magazine I was thrilled to see that a tutorial for one of Debbie's mixed media necklaces features one of my felt flowers combined with a beautiful PMC leaf, copper wire, beads and cord. Above is a picture of the second page of Debbie's tutorial. Thanks Debbie for creating such a lovely necklce incorporating the flower and I really appreciate the credit and mention in the magazine! This entry was posted in duckett, Duckett's Grove, Felt, Felt jewellery, workshops and tagged Felt, felt accessories, felt bag workshop, felt bags, felt class, felt classes, felt corsage, felt felting, felt felting workshop, felt flower, felt flowers by Nicola. Bookmark the permalink. Proud of you Nicola and no wonder you’re a brilliant artist. Color of the flower is so pretty and cheerful. I love the necklace…It is gorgeous! I’m trying not to look at any of the cool polymer clay or PMC pieces that you’re tempting me with, as I don’t have room for one more ounce of anything in my meticulously organized house…So hope that I won’t be struck by lightening for that statement! 😉 I’m sure that you’ll soon have me on this latest bandwagon, too.